Life is a journey, everybody will have their own moments, good and bad. Usually, we capture the moment with our camera phone to take some photos and save it to the photo album. 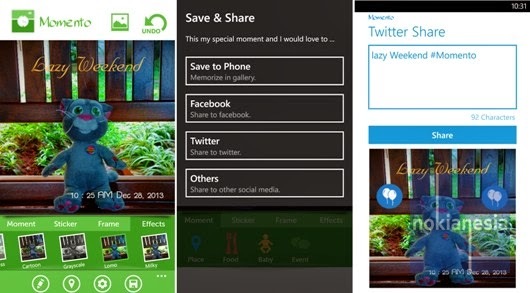 With "Momento" for Nokia Lumia with Windows Phone 8, your photo moment will be enriched with some decorations. You can overlay your photo with some moments, captions, frame, stickers and effects. And share your photo moment to your families, friends and everyone. "Are you celebrating your graduation? attending your best friend's wedding? blowing your candles birthday cake off? Those are perfectly your best lifetime moments! dont ever miss it by not capturing your moments. 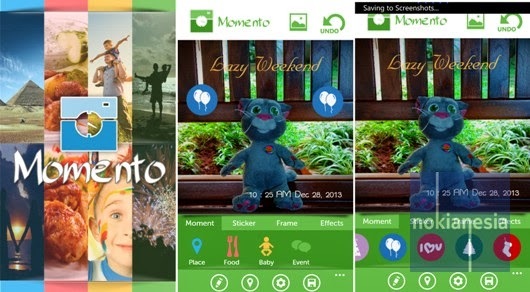 Now an amazing and outstanding app has been made, Momento helps you memorize all precious moments along your life, so do not hesitate for capturing and sharing them in easiest way"